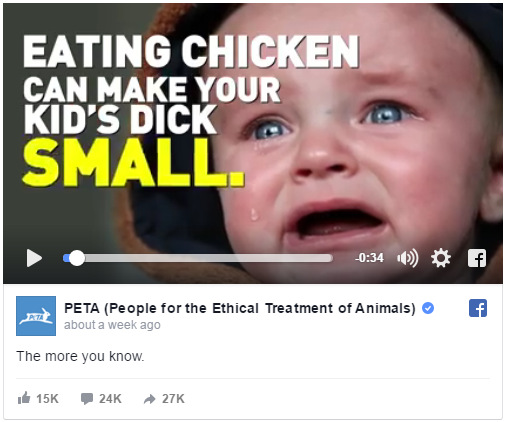 People for the Ethical Treatment of Animals (PETA) is notorious for its use of sexually explicit themes to promote its vegan agenda. The self-described “press sluts” have conducted so many demonstrations in skimpy clothing over the past decades that such actions are hardly notable anymore. So, with the “lettuce ladies” losing their shock value (and the supply of billboards willing to show degrading images of women dwindling), where does the world’s most notorious animal rights group turn? The argument is as feeble now as it was then. When PETA surfaced the chicken-causes-deficiency claim a couple of years ago, Dr. Joe Schwarcz of McGill University’s Office of Science and Society characterized the notion as “simply junk science” (since no research had actually, you know, researched any effect of maternal chicken consumption and male size). PETA doesn’t care about being correct: It cares about being crass.